Our Small Group Private Training sessions allow for a more personal and individualized approach to strength training and conditioning for you and your friends/teammates. 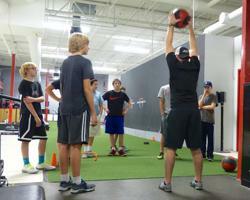 Our strength and conditioning coaches will create a specific program for your group's specific needs as hockey players based on assessments and evaluations throughout the sessions. Each athlete will receive a workout card to follow and record to help them stay accountable toward their strength gains and progressions.